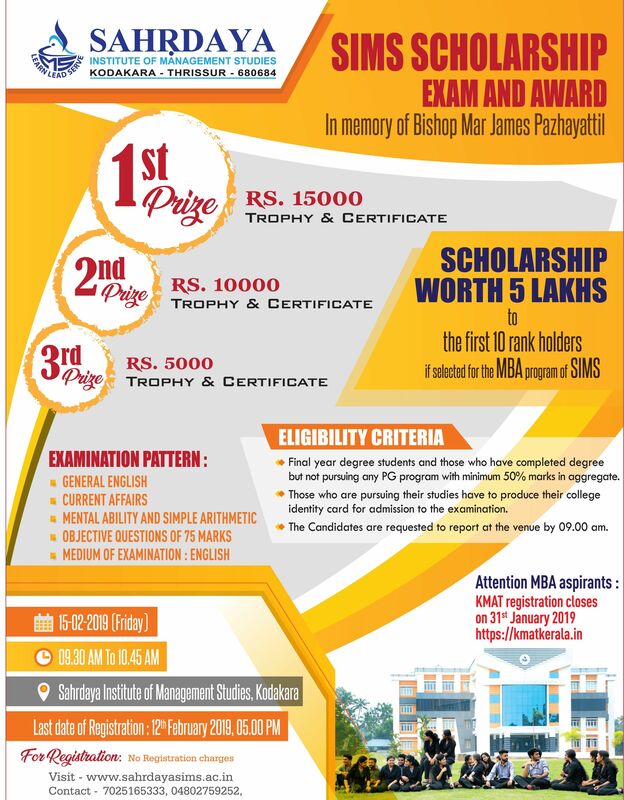 Sahrdaya Institute of Management Studies (SIMS) invites applications for SIMS Scholarship Exam 2019. ** Final year degree students and those who have completed degree but not pursuing any PG program with minimum 50% marks in aggregate. 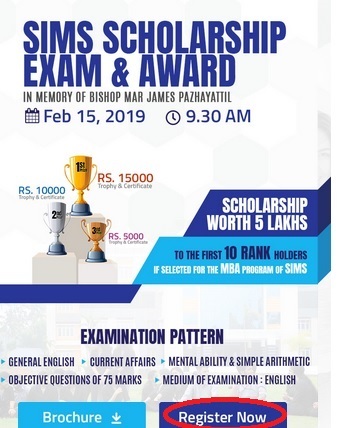 Just follow the below steps to register for SIMS Scholarship Exam 2019. Step 1 : Go to the official website of SIMS through the URL provided above. Step 2 : Then click on the “Register” button in the home page under SIMS Scholarship Exam & Award. ** Candidates seeking admission to the MBA degree course should have passed any degree of the University of Calicut (including degree programmes of SDE, University of Calicut) or of any other University or institute or institution recognized by the UGC or AICTE. Programmes of other Universities or institutions shall be in 10+ 2+ 3 pattern (or 10+ 2+ 4) under regular stream. ** In all the cases, the student should have passed the bachelor degree examination with not less than 50 % marks in aggregate including the marks of languages if any (without approximation, that is, 49.9999 % is not eligible since it is less than 50%), to be eligible for admission. ** However, SC/ST, OBC, and other eligible communities shall be given relaxation as per University rules. The programme will be delivered in 4 semesters (2 year period). Each semester will be of 16 weeks duration. The students can opt for dual specialization in the areas of their choice. If the student chooses three courses in one specialization area and two courses in another specialization area, he or she will be issued mark lists with dual specialization as Marketing Management and Financial Management etc. The candidates will be selected on the basis of the entrance score (approved by the University, AICTE and the Admission Regulatory Committee, Government of Kerala), Group Discussion and Personal Interview conducted by the institute. 50% of the total seats may be filled up based on university allotment.